We've Been Nominated—Now We Need Your Vote! We’re thrilled to announce that we’ve been nominated for a local “Top Choice Award 2019“! Every year, the best local businesses are nominated by actual members of the community, and this award is one of the best endorsements we could receive. On behalf of our entire team, we’d like to thank you for this incredible honor of being nominated—but now we need your help…by voting for us! 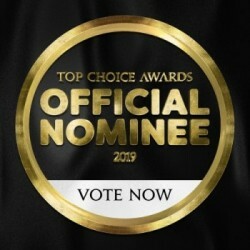 From now until January 2nd, 2019, you can vote for us by visiting this link once each day: Top Choice Awards Top Chiropractor in Ottawa. As an added bonus, each time you vote you’ll be automatically entered to win a grand prize of $2,000 cash, as well as one of many shirts from Toppy’s T-shirts. What Are the “Top Choice Awards”? The awards are a way to give back to local businesses while helping to identify excellence in the local community. Recognizing top businesses near you helps others in your area to make an educated buying choice. By sharing your opinion and voting, you’re helping people just like yourself have excellent experiences in the future. Reach out to Ottawa Chiropractic & Natural Health Centre today with any questions or to make an appointment! Great, honest, well explained professional treatment and care.